Tune Sweeper finds duplicates but does not remove any from iTunes. File Permissions for your Music Files. Ensure you have read/write permissions for the music files on your system. If the music files are read-only Tune Sweeper will not be able to remove them from your system. You can run Tune Sweeper with additional permissions as administrator (Windows users only). To do this right click on the Tune Sweeper icon either on your desktop or in your programs folder. Select 'Properties' and then go to the 'Compatibility' tab. On here please select to 'Run this program as an administrator'. Once done press 'Apply' and then 'OK'. Please then re-launch Tune Sweeper and try again. Selecting iCloud items to remove. Ensure that the files you are attempting to remove from your iTunes library are not items just stored on iCloud (tracks with the cloud symbol next to them) as Tune Sweeper will not be able to remove those items. 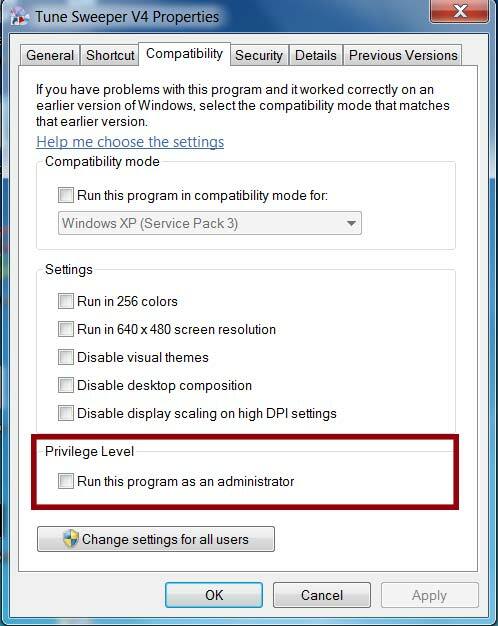 iTunes requires administrator privileges to run. If your iTunes icon has a administrator shield on it and Windows asks for permission to run Tune Sweeper when you run it, then iTunes has been installed for administrator. This being the case, you need to run Tune Sweeper with administrator privileges also. Still Failing to remove duplicates? Once Tune Sweeper has completed the remove process and is reporting errors, click "View Details" to see a report why each of the tracks failed to be removed from Tune Sweeper.This report may provide clues as to why tracks are not being removed.